Want professional quality from a residential ZTR? eXmark may be known for their commercial mowers, but their Quest line offers most of the features of their professional ZTRs in sizes and prices that are within reach of homeowners. Now they’re even better thanks to a recent redesign, adding better engine protection, new styling and an easier to use control panel. The Quest is powered by eXmark’s own 708cc air-cooled V-Twin, designed specifically for their ZTR mowers. It uses a dual barrel carburetor and a specially designed governor that delivers droop-free performance rivaled only by pricey EFI-equipped engines. Since this motor was only recently put into production, it was designed with ethanol in mind and will fine on blends up to 10%. A lot of attention was also paid to maintenance. It has a quick drain hose for easy, mess-free oil changes, and an airbox designed so that the filter fits only one way to ensure the engine is protected from dust and debris. eXmark also makes complete kits that have everything needed for routine maintenance including oil, filters, spark plugs and fuel treatment. Output for this engine in all models is 24.5 hp. It’s not CARB compliant, so it can’t be sold in California. 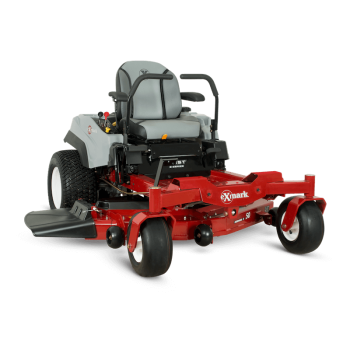 These mowers use Series 2 decks, built from 10 gauge steel with welded wear strips to resist abrasion. E-Series models use two blades, while the wider S-Series decks have three blades. These mount to eXmark’s trademark sealed maintenance-free spindles. People of any size can operate these mowers comfortably. The operator sits in an adjustable high back spring suspension seat equipped with fully adjustable fore and aft bars at two height positions. This update brings a complete redesign of the area around the operator. On the right, a new control center puts throttle, starter and PTO controls within easy reach. On the left, there’s a 2.9-gallon gas tank with a molded-in cup holder and a translucent window to check the fuel level. The Quest is available in two versions: the E-Series and the S-Series. These mowers use a set of Hydro-Gear ZT2100 hydrostatic transmissions and can mow up to 2.8 acres per hour. Top speed is 7 mph when going forward and 3.4 mph in reverse. The E-Series is available with a 34 or 42-inch deck. Hydro-Gear ZT2800 transaxles provide the same top speeds as the E-Series while being strong enough to support the weight of the S-Series’ 50 and 60-inch decks. The S-Series also come with additional equipment. A large steel plate surrounds the rear of the engine to protect it from collisions when backing up, while the deck height can be changed using an assisted foot lever. This model also comes with the hitch kit installed at the factory. Want the foot-operated height control and hitch of an S-Series, but need the compact size of the E-Series? Accessories are available to install both functions. If you want to carry mulch and tools with you without dealing with a trailer, eXmark offers a cargo carrier that adds a small storage deck at the rear of the mower. Kits are available for mulching, bagging and striping to get the finish you want. The mulching kit doesn’t have an impeller like the units found on the company’s larger units, but the large diameter tube of the bagging kit coupled with the sealed mowing chamber of the mulching kit ensures plenty of flow to keep clippings moving. Is the Quest Right for You? Shank’s Lawn Equipment is a certified dealer for eXmark, and we have over three decades of experience helping both residential and commercial customers with their lawn care equipment. If you’re looking to buy a ZTR to take care of your lawn or you need parts or service for your current mower, stop by our shop, located at 4900 Molly Pitcher Highway, Chambersburg, PA. To get here from I-81, take exit 10 to Marion and drive East one mile. Need parts or accessories for your eXmark? We ship to the United States and Canada. To order, visit us online at www.shankslawn.com. This entry was posted in Uncategorized and tagged eXmark Quest ZTR, eXmark Zero Turn Mowers, Shanks Lawn Equipment. Bookmark the permalink.